The term metal awnings can describe several different types of awnings. They can be corrugated metal nailed to a wood structure. Some aluminum type awnings use a metal w-pan in place of a standard aluminum panel because they are less expensive. The most elegant use of the term are the brass awnings. Some metal awnings have a very similar look as that of an aluminum awning. These window awnings from Cheap Awnings are that type. The biggest advantage is the price. At T.M.C.S. they make elegant awnings out of copper, aluminum, brass, stainless steel, galvanized and cold rolled sheet metal. These beautiful awnings are worth taking a look at. Metal is used a lot for commercial carports. Companies like Texas Eagle fabricate these metal carports for all types of commercial uses. Visit Absolute Steel to find many more ways metal can be used to make attractive awnings, patio covers and carports. This is a metal freestanding awning made by VersaTube . 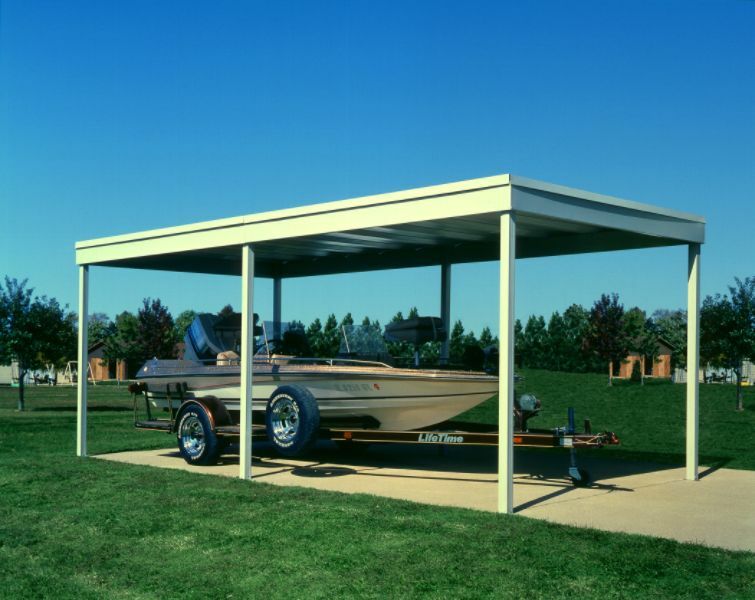 This type of structure is perfect for covering cars, boats, RV's or anything else of value. This is one of the most popular metal awning on the web. The awning pictured is a freestanding model and an attached one is also available. The 10' x 10' size is just right for a small patio or an entry way type door canopy. For under a thousand dollars this is not a bad buy. The biggest drawback is that custom sizes are not available. It's 10' x 10' or 10' x 20'. If either of these sizes fit your needs, attached or freestanding, here is where to find them.